In August 1980 plans were announced for a new third level air service for Masterton. The yet to be formed Wairarapa Airlines Ltd announced their intention to offer flights from Masterton to both Auckland and Christchurch using Mitsubishi Mu2B ZK-WAL (c/n MU2-037). The new venture was to be financed by two Fielding based men, Tony Millen and Peter Christie with the Mitsubishi being available to the commercial division of the Wairarapa and Ruahine Aero Club (Inc.) for its air taxi requirements when it was not being used on airline services. Partenavia P68B ZK-LAL (c/n 70), which was owned the Aero Club’s Chief Flying Instructor, Warren Hamilton, was to be used by the company as a backup for the Mitsubishi and also for charter work. An application to the Air Services Licencing Authority was successful. The company also applied for a non-scheduled service between Masterton and Wellington but this route was never operated. Partenavia ZK-LAL was to be the backup aircraft and carried Wairarapa Airlines titles. It is shown at Masterton on 8 January 1981. The company, while having obtained the licence, had more difficulty obtaining the aeroplane. Delays were experienced getting the Mitsubishi ready for service and it finally emerged that the aircraft was unsuitable for operation from Masterton’s Hood Aerodrome. After months of delay the company applied to the Air Services Licencing Authority in May 1981 to substitute the Mitsubishi with a Piper Pa31-350 Navajo Chieftain. Permission was duly granted and ZK-PKC (c/n 31-7405207) arrived in Masterton on the 12th of August 1981. Weekday flights from Masterton to Auckland and Christchurch began on 17 August 1981. The Chieftain had an early morning departure for Auckland before returning to Masterton. The aircraft then headed south to Christchurch, returning to Masterton by mid-afternoon. The schedule was later changed so that on a Wednesday the Chieftain would spend the whole day in Auckland offering Masterton business people a same day return service. From November 1983 the company introduced a late Friday afternoon Masterton-Auckland service which returned in the early evening. The condition of Hood Aerodrome was, from the beginning, a concern to the company. Pressure was brought to bear on the local authorities for runway lights and these were installed in January 1982. 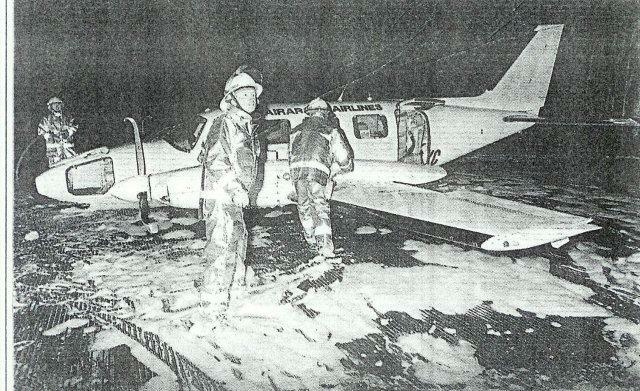 The appeals for a sealed runway fell on deaf ears for many years though, undoubtedly, the pressure brought to bear by Wairarapa Airlines had a major influence on the runway eventually being sealed. In May 1982 the Partenavia was dropped from the company’s approved fleet and replaced with Piper Pa32-300 Cherokee 6 ZK-ERL (c/n 32-7540184) which was used for charter work. Piper Cherokee 6 ZK-ERL was used for charter. It is seen at Masterton on the 12th of July 1982. In October 1982 the company applied for a Temporary Air Service Licence to operate a Swearingen Metroliner II aircraft on its routes for a period of three months. The company was also looking at a merger with Auckland-based United Pacific Airlines. In its application the company said it had carried over 8,000 passengers since commencing services and that the passenger demand in December and January was already heavy and unlikely to be met without supplementary aircraft. The merger with United Pacific Airlines would have seen Peter Christie with a 50 per cent shareholding in a new company with the Metroliner flying out of Masterton to Auckland and Christchurch while the Chieftain would have been used on United Pacific’s Auckland-Kaikohe and Auckland-Kaitaia services. These plans came to nothing, however, as Hood’s unsealed runways made Metroliner operations impractical. In April 1983 another change was made to the licence, this time the Cherokee 6 being replaced by Beechcraft 58 Baron, ZK-STG (c/n TH-1103). This aircraft was owned by Stewart Dawson Jewellers and it was made available for the company for hire for when the Chieftain was out of service and for smaller charters. 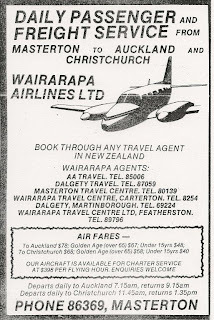 On the 4th of October 1983 it was announced that Hansells (NZ) Ltd, the Masterton-based drink and food concentrate manufacturer, had bought Wairarapa Airlines Limited. Peter Christie was retained as a pilot and office employee. The chairman of directors and managing director of Hansells, Mr John Maunsell, became managing director and he wasted no time in applying pressure for the sealing of Hood Aerodrome’s runway and looking for expansion. The following month the company announced it was considering extending its service to include Taupo, Rotorua and Nelson. In December 1983 approval was given for flights to begin to Rotorua and Nelson and notification was given to the ASLA that Masterton-owned Piper Pa23-250 Aztec D, ZK-CUS (c/n 27-4499), was to replace the Baron as the backup aircraft and to operate the new routes. The company also advised the ASLA that Piper Pa31-350 Chieftain ZK-EVD (c/n 31-7405241) would be used when the company’s own Chieftain was being serviced. The new Masterton-Nelson and Masterton-Rotorua routes began in January 1984. Piper Pa23 Aztec ZK-CUS (above) was normally used for flights to Nelson, Hamilton, Rotorua or Tauranga but it is seen here arriving at Auckland on 11 May 1984 after a flight from Masterton. The Aztec was being used after ZK-PKC aquaplaned at Masterton. Disaster struck the company on the 9th of May 1984. After a scheduled flight from Auckland the Chieftain, ZK-PKC, was coming in to land at Masterton in darkness and heavy rain. After touching down the plane aquaplaned on the grass runway. The pilot, David Atkinson, attempted to slow the plane down by ground looping it as it neared the northern end of the runway. The aircraft, however, slid for about 100 metres before hitting a wire fence and coming to rest with its left wheel in a roadside ditch damaging the port wing and undercarriage. None of the eight passengers or the pilot were injured in the incident. With ZK-PKC out of the air the Piper Aztec was used to maintain the Auckland and Christchurch flights while Mount Cook Airlines’ Chieftain ZK-MCM was chartered when loads necessitated a larger aircraft until such time as a new Chieftain arrived. The company had initially experienced big losses but by 1984 was breaking even on its Christchurch and Auckland routes with an average of five passengers per flight. PKC was out of the air for longer than expected, needing a new wing, so a second Piper Chieftain, ZK-WAI (c/n 31-7405185), was obtained. This flew its first charter on the 15th of June 1984 and then operated the normal scheduled from the 18th of June. ZK-WAI had modified which enabled it to land at a lower speed making it more suitable for operations into Hood. Similar modifications were also done to ZK-PKC which returned to service late in July. With ZK-PKC back on line the company inaugurated a third weekly Masterton-Nelson flight on Wednesday mornings with the aircraft then continuing on to Christchurch. The flight returned in the late afternoon/early evening meaning Masterton people could have a full day in Christchurch or Nelson. These flights commenced on the 5th of September 1984. At that time the company said loadings on the Nelson-Masterton services varied from full to one passenger which was “marginally economic.” The hope was that the Nelson-Christchurch service would put the Nelson flights comfortably in the black. 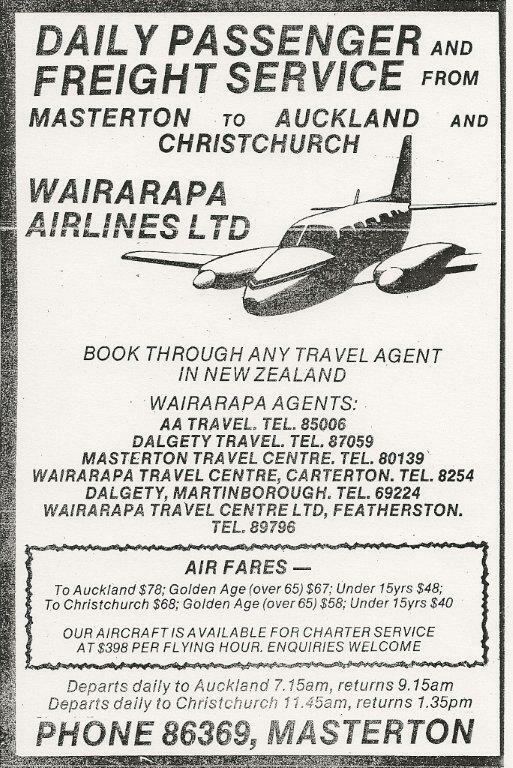 Christmas 1984 presented Wairarapa Airlines with an unexpected Christmas bonus. Air New Zealand was affected by strike action with flights galore cancelled in the days before Christmas. Along with many other commuter airlines and aero clubs Wairarapa Airlines was quick to step in and offer extra flights for the desperate Christmas travellers stranded by the strike action. In August 1985 the company advised the ASLA that a third Chieftain, ZK-PAI (c/n 31-7852118), had been added to their fleet and that from the 12th of August 1985 the company was adding Tauranga to its Rotorua flights in favour of Hamilton. However, the Tauranga flights were short-lived. The following month the company announced that with continuing substantial losses the directors had decided to concentrate on the major routes and to curtail those that were unprofitable. 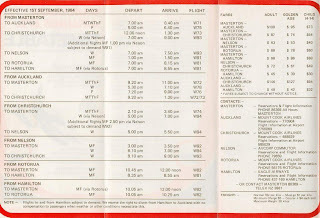 The timetable from the 1st of October 1985 saw the cutting of services to Rotorua, Tauranga and Nelson leaving the company concentrating on the core Auckland and Christchurch routes. ZK-PAI was only operated by Wairarapa Airlines for a relatively short time. It is seen here at Christchurch on the 24th of November 1985﻿. 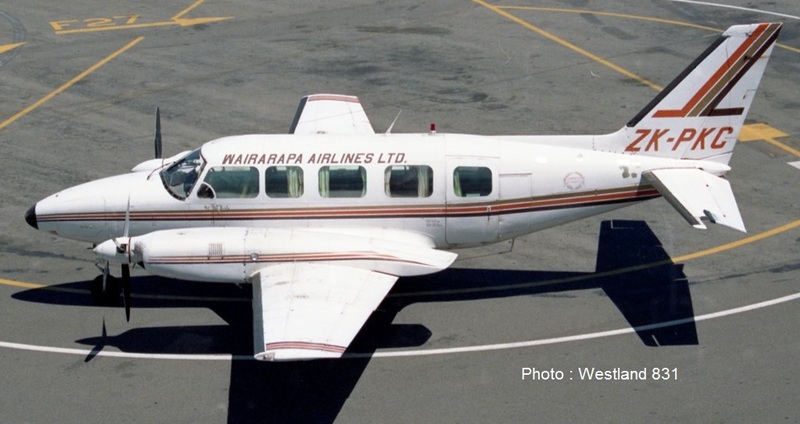 With the collapse of Air Albatross in December 1985 Wairarapa Airlines returned to Nelson. Starting on the 24th of December 1985 the company introduced a daily Masterton-Nelson-Christchurch service from Monday to Friday departing Masterton at 7am and returning in the evening at 8prn. 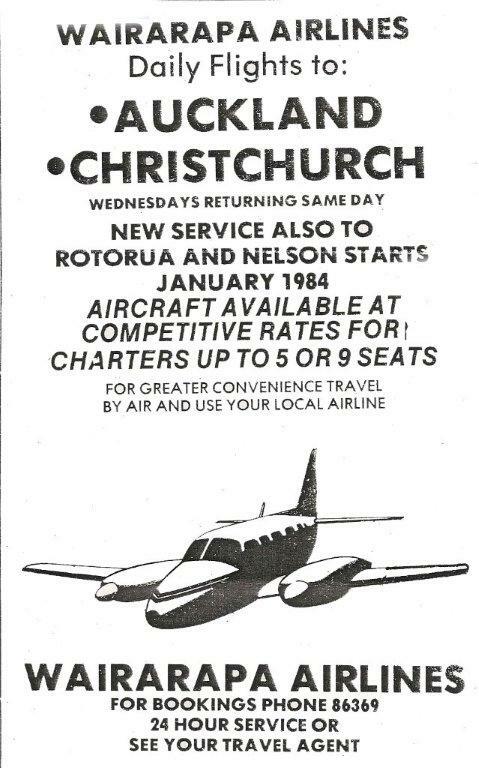 The service was not successful, however, and on the 21st of April 1986 the company cut the Nelson-Christchurch service and the Masterton-Nelson service was reduced to two flights a week on Mondays and Thursdays. 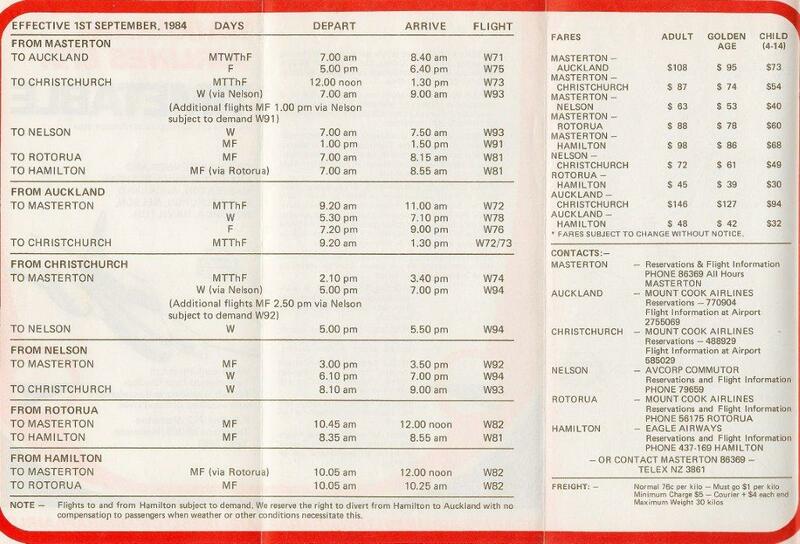 Eventually these flights were also cut with the timetable of 16 March 1987 showing flights to and from Auckland and Christchurch only. The airline had been at a break-even point for some time and previous losses had caused problems in funding capital repayments. In early 1987 the Wairarapa business community was asked to invest $200,000 to keep it flying. This did not eventuate, despite good support from local businesses. On the 3rd of April 1987 the Dominion reported the airline had been bought from Hansells NZ Ltd by a consortium of Auckland travel companies, later revealed as Worldwide Air Travel Ltd managing director Lindy Christian and Gulliver's Travel Ltd managing director Andrew Bagnall. At some point in 1987 the Nelson service was dropped. With once again the need for only one Chieftain ZK-WAI stopped flying in 1988 and was used as a source of spares for ZK-PKC. The advent of the Ansett NZ and Air New Zealand air wars and cheap fares greatly affected the airline. Cheap fares on the main trunk enticed passengers to drive to Wellington to pick up these fares to Christchurch and Auckland. In particular this impacted on flights to the South Island. 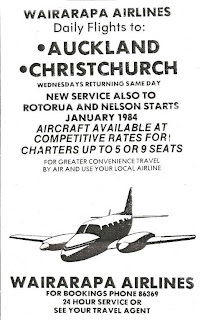 In July 1989 the Christchurch service was reduced to two flights a week on Mondays and Fridays and then in mid-1990 the Christchurch service was cut completely. Despite these cuts the airline still did not make a profit. On the 9th of September 1991 the airline announced it was going into a three month recess. Secretary manager Alan Stewart told the Wairarapa Times-Age, “There is always a danger we will not be able to get started again, but we are hopeful." The company was relaunched late in February 1992, with one Wednesday flight between Masterton and Auckland each week. This was later extended to a second flight on Fridays. During the rest of the week the Chieftain was used for other work, including night time courier work for United Aviation of Palmerston North. On the 8th of March 1994, on one these courier flights to Christchurch, ZK-PKC had a gear up landing at Christchurch. Neither of the two pilots were hurt. Despite this additional charter work the resurrected air service was still beset with the same lack of loadings and the scheduled service finally ended in early January 1997. ...and rather sad at Christchurch on the 8th of March 1994 (Photo : The Press). A big thanks to the staff of Archive Wairarapa for helping with my research at Masterton!